If you like to have a electric toothbrush at home AND on the road like I do, then you will love the Rechargeable Electric Toothbrush with charging base by ToiletTree Products. It comes with a FREE travel sonic toothbrush! 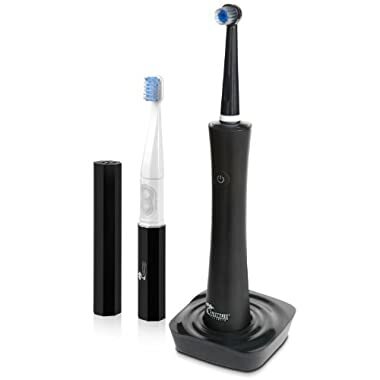 With this purchase, you not only will receive a high quality electric toothbrush for home, but you also will receive a bonus smaller travel size sonic toothbrush to take on the road with you. This toothbrush operates at 8,800 oscillations per minute which helps to remove more plaque than a regular manual toothbrush to keep your teeth at their best. It features 2 power setting modes for people with sensitive teeth. 2 minute auto-timer ensures dentist recommended brushing. 2 brush modes - Clean & Sensitive. Brush operates at 8,800 oscillations per minute which helps to remove more plaque than a regular manual toothbrush. 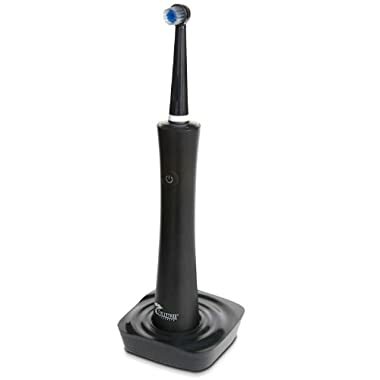 You can purchase the Rechargeable Electric Toothbrush with charging base by ToiletTree Products for $39.95 from the ToiletTree website.